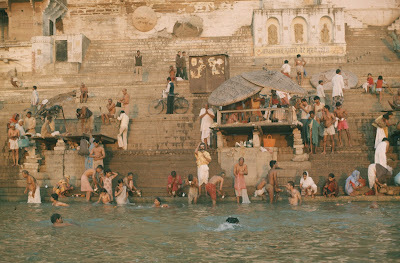 Hindus bathe on the ghats early in the morning to cleanse themselves of sin. As I have been lecturing on world wonders recently, I was recalling two memorable mornings from long ago. The first morning I watched the rising sun casting light on the stone ghats, or steps, leading down to the Ganges, considered in India as the holiest river in the world. I was with a group of mostly English travelers — Carla couldn’t fit the trip in her schedule — living on a train that crossed the country. 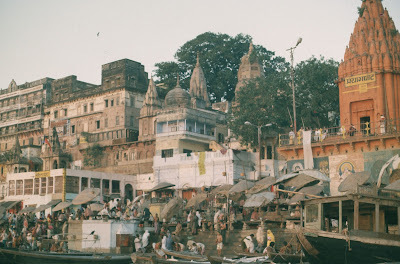 Our guide was rowing us along the holiest city in the world — Varanasi, also known as Benares. 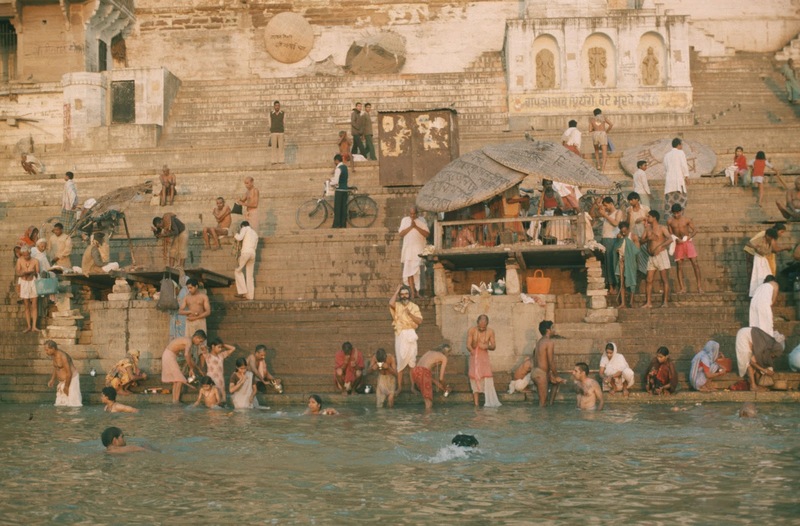 The ghats run about 3 miles along the riverfront, which was crowded with people bathing — a holy ritual that our guide said would cleanse them of their sins. I asked him if the worshippers were running a risk of getting sick, as the Ganges looked terribly unsanitary. He gave me a look that indicated I was a person of limited understanding and insisted that, as a holy river, the Ganges destroys all bacteria upon contact and dissolves bones in three days. Above the bathers on the upper tiers, we saw some of the ever-present cows, a man on a bicycle, beggars and small sales booths. When we reached the area where we expected funeral pyres to be burning, there was only one body. I had looked forward to seeing at least one because it is such an important ritual in the Hindu religion. To get a better view of what the rituals involved, I made plans to come back the next day. Hindus believe you will be reborn after death, and what form you will take will depend on how closely you followed the rules of the status you were born into. What a person will be reborn as is questionable, and as a result, Hindus do not always look forward to the next life. It might be bad now, but it could be even worse next time. The possibility that they might have what was once a human soul is one of the reasons cows in particular are considered sacred. Varanasi offers a special way to avoid being reborn in any form, human or animal, for to die naturally in Varanasi is to achieve “moksha.” If the right rituals are performed, the reincarnation cycle will end. In the Hindu faith, Varanasi is the home of Shiva, creator and destroyer. It is Shiva who whispers a sacred mantra into the ears of the dying, granting them freedom from reincarnation. I made plans to come back the next day to see if any bodies were being prepared and burning there. After our boat trip, our group spent the rest of the day exploring Varanasi. Besides those who had come to die, the city was full of religious pilgrims who came to worship at the many shrines and temples. We found ourselves rubbing shoulders with religious men, beggars and more cows. The town is famous for its fine silks and the saris made from them, and a number of us could not resist — after intense bargaining — buying one. The next day, none of the people who had gone with me on the boat ride wanted to go back to Varanasi; they just didn’t like it. The narrow streets and sheer mass of humanity overwhelmed them. Two young men from Norway were interested, however, and joined me on a return visit to the burning ghats. When we arrived, we saw four bodies on pyres and another three were being prepared. Four men accompanied by drummers and pipers carried a body with a bright pink covering down the street. The body was ritually placed in the Ganges along the shore. After proper prayers and splashes of water, it was placed on a wood pyre, and the fire was started. As we watched, a man poked the bodies that had been burning for a while with a stick and at one point smashed them with something like a baseball bat to break them up so they would burn more completely. It takes three hours for a body to be consumed, after which the ashes and anything left over are thrown into the Ganges to be further purified. It is said that at this point the person’s soul is thus freed from reincarnation. I checked for recent information on the burning ghats and found that the practice has changed little since my visit, but the government has some concern about pollution from the ashes of 80 bodies a day being dumped into the Ganges. A burning also takes a lot of wood and adds to the air pollution in the area. For now, however, the practice continues.